The multicultural band, Chutney, will perform a free concert Wednesday, June 30, at 11:45 a.m. at the University of Wyoming Simpson Plaza. The event is open to the public. 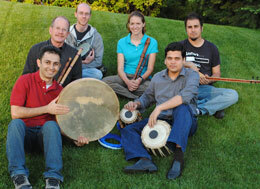 Chutney is comprised of a lively group of musicians from Iran, Turkey, India, Nepal and the United States. The name reflects the group's special blend of acoustic music styles from around the world. The Campus Activities Center sponsors the concert as part of its summer programs schedule.